Formed in the spring of 1977, Germany. This is a re-release of their classic second album Tour de Trance. 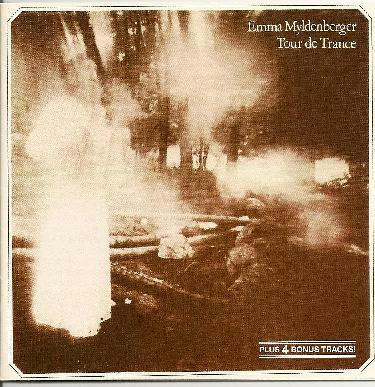 Emma Myldenberger are a magical, strange, and ambient folk collective, who gave the often-rousing medieval music of Europe a new lease of life back in the 70’s. At times it is like you are listening to the soundtrack of an epic odyssey style film of the time. The sound is primitive yet highly orchestral, and it conveys an almost unnatural ambience that places you straight into the Medusa’s lair. It is enchanting to the ear and it beautifully recorded. The sound is cinematic. It moves through gypsy styled music, manic and highly energetic, yet at times the most emotionally sorrow laden music you will ever here. It courts the folk music of Germany, sometimes serious and stern, yet also poetic and fluent with a light heart under the harsh accent of the language, as all lyrics are in the Germanic tongue.It is similar in places to something that The Incredible String Band, Robin Williamson & his Merry Band or The Amazing Blondel would conjure up musically, but I would not say that they sound like The Amazing Blondel or The Incredible String Band, as there is a more European sound to Emma Myldenberger than say the Amazing Blondel, but with the use of Crum Horn as the melodic instrument, the resemblances does lie there. I mention The Incredible String Band because the tracks are crafted with strangeness about them, which is very reminiscent of The Hangman’s Beautiful Daughter era Incredible String Band, yet this album is more cinematic and conceptual than the aforementioned. So I would say that its Robin Williamson & his Merry Band that comes closest to Emma Myldenberger’s sound out of the three that I mentioned. It is said that this is one of the best psych folk LP’s ever made! If not, it is up there with the best! Quality stuff.